November 30, 2015 – The James Webb Space Telescope’s “pathfinder telescope,” or “Pathfinder” recently completed its second super-cold optical test that resulted in the first checkout of specialized optical test equipment designed to illuminate the telescope’s optics through to the instrument focal planes, and the procedures used to operate this test equipment. While the actual flight elements of NASA’s Webb telescope are assembled, engineers are testing the non-flight equipment installed in the test chamber to ensure that tests on the real Webb telescope later go safely and according to plan. 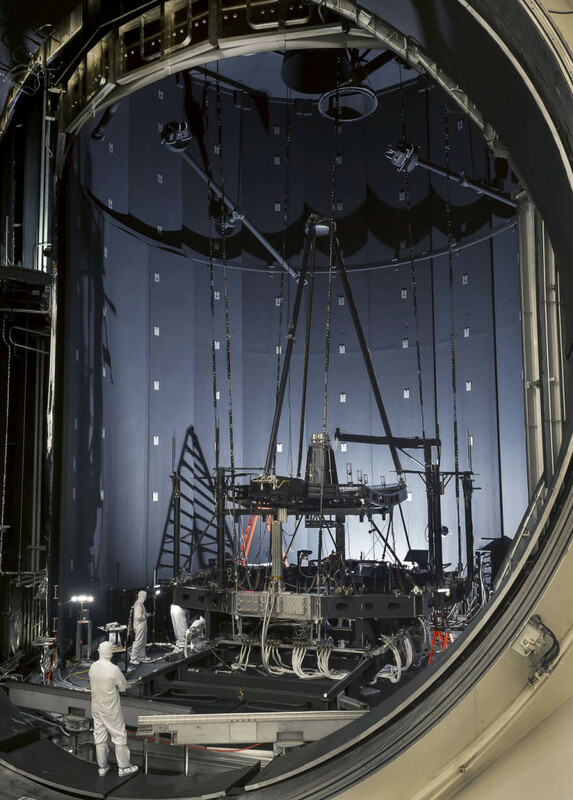 After the first Pathfinder test was completed in June 2015, the Aft Optics System or AOS, which includes the Tertiary Mirror and Fine Steering Mirror, was installed on the Pathfinder to prepare for a second test. The Pathfinder is a non-flight replica of the Webb telescope’s center section backplane, or “backbone,” that includes flight spare mirrors. The full Pathfinder was then outfitted with special fiber-fed infrared optical sources that simulate star images. Those star images, or infrared sources, along with a specially instrumented infrared detector were used during the second test to perform end-to-end testing of the full Pathfinder telescope system. The AOS and the source system was built by Ball Aerospace and Technologies Corp’s facilities in Boulder, Colorado. “Practice makes perfect. Since we will be testing the world’s largest ever cryogenic telescope for the first time in the world’s largest cryogenic test chamber, we need to be experienced in using our test equipment so we can focus on the performance of the telescope,” said Mark Clampin, Webb telescope Observatory Project Scientist at NASA’s Goddard Space Flight Center in Greenbelt, Maryland. The flight backplane comes in three segments, a center section and two wing-like parts, all of which will support large hexagonal mirrors on the Webb telescope. The pathfinder only consists of the center part of the backplane. However, during the test, it held two full size spare primary mirror segments and a full size spare secondary mirror to demonstrate the ability to optically test and align the telescope at the planned operating temperatures of -400 degrees Fahrenheit (-240 Celsius). The test equipment used to test the telescope primary mirror and used to hold the entire pathfinder telescope were built by Harris Corporation of Rochester, New York. The first and second cryogenic optical testing of the Pathfinder were conducted in Chamber A at NASA’s Johnson Space Center in Houston, Texas, where the testing of the flight hardware will occur in 2017. The extremely cold conditions inside the chamber are created by running liquid nitrogen and extremely cold helium gas through plumbing criss-crossing the surface of two big metal shells or “shrouds” nested inside the chamber walls. “Now that the second test is done, it means that all optical test systems have been checked out,” said Lee Feinberg, Webb telescope Optical Telescope Element Manager at NASA Goddard. A third and final precursor test called “Thermal Pathfinder” will follow in 2016 that will fully test all the test equipment needed to simulate the temperature environment of space. Once this is complete, all test equipment and procedures needed to test the actual full flight telescope in early 2017 will be checked-out and ready. 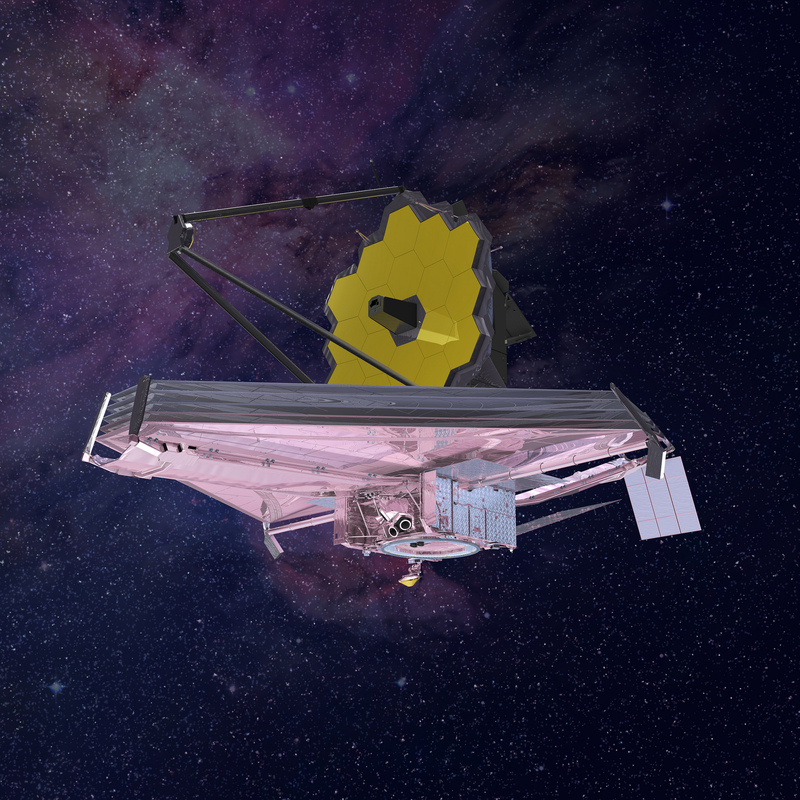 The James Webb Space Telescope is the scientific successor to NASA’s Hubble Space Telescope. It will be the most powerful space telescope ever built. Webb is an international project led by NASA with its partners, the European Space Agency and the Canadian Space Agency.